Most of the evidence regarding dermatoses secondary to Indian cultural practices is scattered in the literature and comes from case reports and case series. In the Asian subcontinent, the presence of various socio-religious and cultural practices along with widespread use of complementary and alternative medicine frequently result in a host of secondary dermatoses. With increasing migration and sharing of cultures, it is vital for dermatologists to be familiar with these dermatoses. This review focuses on Indian cultural and religious practices and traditional medicines which can result in skin disorders. The history and origin of henna is hard to trace with centuries of migration and cultural interaction. The active ingredient of henna is lawsone (2-hydroxy-1, 4-naphthoquinone). It is derived from the leaves and flowers of Lawsonia inermis, family Lythraceae, a plant which grows in hot climates of northern Africa and western and southern Asia. Hence, it is not surprising that the use of henna has flourished in these regions. 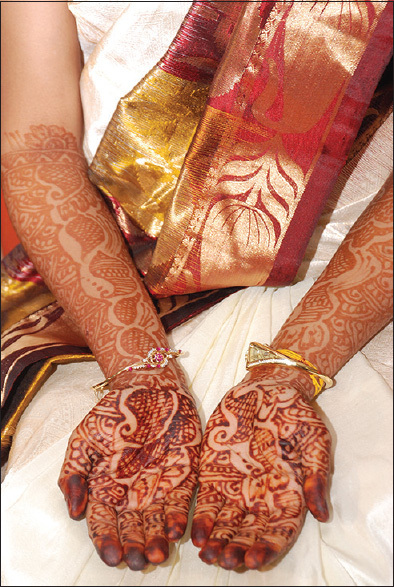 In India, henna is used as Mehndi [Figure 1] and also as a hair dye. In the West, henna has gained popularity in recent years as a temporary tattoo as it does not require any piercing (pseudo-tattooing). Traditionally, several medicinal properties are attributed to henna. It is also believed to act as a preservative for leather and cloth as it repels pests and mildew. Pure henna rarely causes allergic reactions. However, cases of palpebral eczema, allergic contact dermatitis and immediate-type hypersensitivity with urticaria, rhinitis, conjunctivitis and bronchial asthma have been recorded, ,, with type-I hypersensitivity being confirmed by both skin prick test  and radio allergen sorbent test (RAST). In most cases, allergic reactions are caused by coloring agents like para-phenylenediamine (PPD) ("Black henna"), diaminotoluenes and diaminobenzenes which are added to pure henna for quicker drying and deeper color intensity. In one study, the prevalence of patch test positivity to PPD among beauticians and hairdressers was 35%, whereas it was only 3% to pure henna. In fact, the percentage of PPD may be as high as 64% in products purporting to be henna. Heavy metals like nickel and cobalt, which are often present in henna tattoo mixtures, have also been proposed as inciting agents for sensitization. PPD has been known to cause severe generalized vesicular erythema multiforme-like reaction,  and contact angioedema  progressing to involve pharynx, larynx and bronchi with hoarseness of voice and stridor. More seriously it may cause acute renal failure and ultimately death due to renal tubular necrosis. It has been reported to cause pruritus, severe bullous contact dermatitis,  post inflammatory hypo or hyperpigmentation, , persistent leukoderma,  hypertrichosis,  lichenoid reactions  and keloids. , Hyperbilirubinemia was observed in glucose-6-phosphate dehydrogenase (G6PD)-deficient individuals exposed to henna, due to oxidative hemolysis. These patients may have been previously sensitized to PPD through exposure to hair or textile dyes, black rubber products, plastics, oils, adhesive tapes, shoes, petrol, certain cosmetics, and ballpoint pens. , The mechanism of sensitization is based on the conversion (by oxidation) of the pro-hapten (PPD) to the hapten (quinone diamine) that can react directly with a protein, causing irritation of the skin and mucous membranes of the sensitive individuals. There have been demands for legislation that prohibits the use of PPD in black henna tattoos. Therefore, patch tests for PPD and heavy metals should be conducted when henna-related allergic contact dermatitis occurs, along with additional tests as necessary. In India, it is often difficult to obtain the exact constituents of kumkum from the manufacturers for patch testing. The present knowledge of the constituents of kumkum comes from a limited number of case reports and case series. The commercially prepared kumkum has been shown to contain Brilliant Lake Red R, Sudan I, aminoazobenzene, canaga oil, fragrances, groundnut oil, tragacanth gum, turmeric powder,  thimerosal, gallate mix, PPD, Kathon CG, benzotriazol, tert-butyl hydroquinone,  parabens, , 'chandan',  chalk powder colored with various azo dyes  and other dyes (coal tar dyes, toluidine red, erythrosine, and lithol red calcium salt). The red-colored powder "sindoor" contains mercury and the black paste lead sulfide. It is common to see saffron, ash or camphor being smeared onto the neck or forehead skin in the temples (personal observation). These drugs are often dispensed in small paper or plastic packets, and there is no documentation of what drug has been prescribed. However, on detailed analysis, one in five herbal medicine products was shown to contain potentially harmful levels of heavy metals like lead, mercury, arsenic, chromium and cadmium. Arsenic can cause punctate palmoplantar keratoderma, leukomelanoderma, arsenical keratosis, Bowen's disease, squamous cell carcinoma,  and non-cirrhotic portal fibrosis. Mercury can cause gingivitis, stomatitis, excessive salivation, acrodynia,  tylotic eczema, dryness of the skin, skin ulceration and erythroderma. Chromates, in addition, can cause allergic contact dermatitis in sensitized individuals. 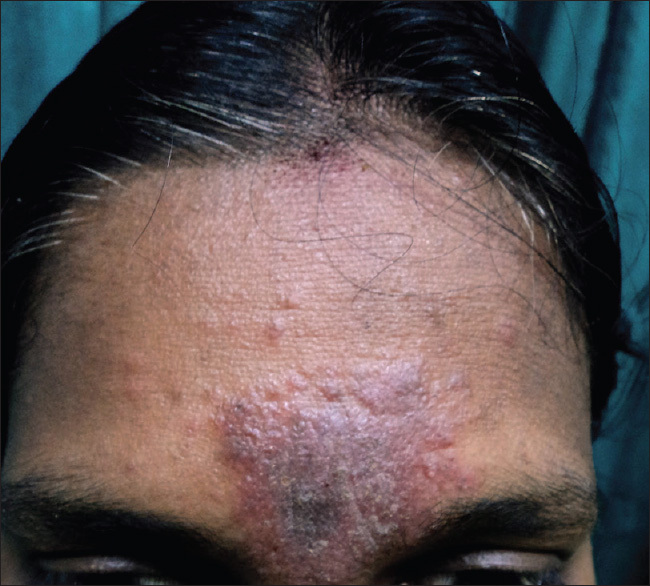 The authors have seen patients of pemphigus and pyodermas, with skin lesions smeared with dry paste of neem (Azadirachta indica) leaves [Figure 6] or sandalwood/turmeric powder [Figure 7], resulting in disease flare, irritant dermatitis, secondary infection, and even life-threatening sepsis. Conversely, mustard oil has been implicated in causing pityriasis rosea-like eruption which was subsequently confirmed by patch testing. Almond oil application led to percutaneous sensitization and contact dermatitis in an atopic child. Although contact allergy to pure coconut oil is rare, mild irritant reactions and sensitization to coconut derivatives like cocamidopropyl betaine, , cocamidopropyl dimethylamine,  coconut diethanolamide,  and cocamidopropyl PG dimonium chloride phosphate  have been reported. 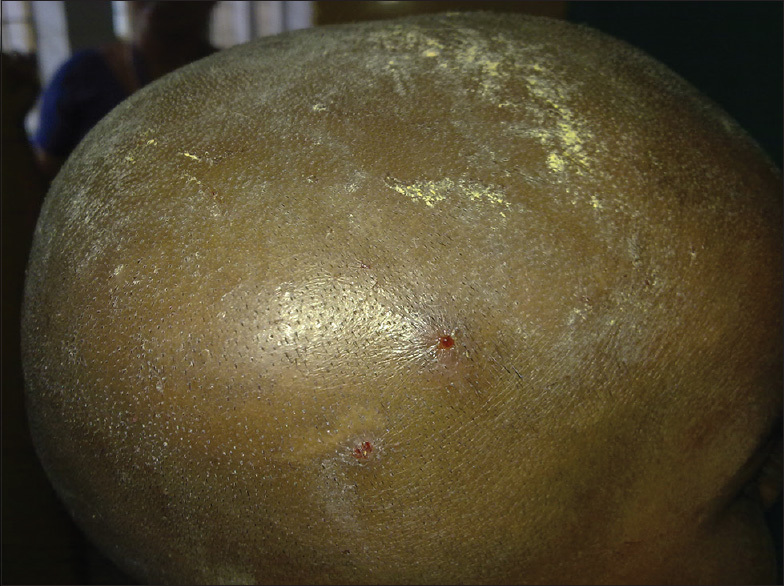 However, it must be noted that these adverse effects were secondary to topical cutaneous application of the oils and/or occupational exposure, and not because of use over scalp. Cultural and socio-religious beliefs influence our daily lives and have the potential to introduce health hazards in our body. In this era of globalization, cultural practices cut across geographical boundaries. Raising awareness among physicians with regards to "cultural dermatology" is thus important. Modern dermatologists should be sensitive to ethno-cultural aspects of dermatoses and must be encouraged to ask directed questions about the same. This is especially relevant in migrant populations who are trying to integrate into new societies and thus may be hesitant to volunteer such information unless specifically asked for. Testing for safety of various chemicals being used or added in these cosmetic products like essential oils, balms, henna, bindis, kumkum and holi colors should be regulated. The constituents of the products need to be put on the cover. Most of the evidence regarding the above-mentioned adverse effects comes from case reports and hence establishing a causal link to the perpetrating agent is difficult. A systematic research into this complex area is called for. The cutaneous manifestations resulting from Indian socio-cultural practices are summarized in [Table 2]. Polat M, Dikilitaş M, Oztaş P, Alli N. Allergic contact dermatitis to pure henna. Dermatol Online J 2009;15:15. Kazandjieva J, Grozdev I, Tsankov N. Temporary henna tattoos. Clin Dermatol 2007;25:383-7. Le Coz CJ, Lefebvre C, Keller F, Grosshans E. Allergic contact dermatitis caused by skin painting (pseudotattooing) with black henna, a mixture of henna and p-phenylenediamine and its derivatives. Arch Dermatol 2000;136:1515-7. Kang IJ, Lee MH. Quantification of para-phenylenediamine and heavy metals in henna dye. Contact Dermatitis 2006;55:26-9. Belhadjali H, Ghannouchi N, Amri Ch, Youssef M, Amri M, Zili J. Contact dermatitis to henna used as a hair dye. Contact Dermatitis 2008;58:182. Majoie IM, Bruynzeel DP. Occupational immediate-type hypersensitivity to henna in a hairdresser. Am J Contact Dermat 1996;7:38-40. Ventura MT, Di Leo E, Buquicchio R, Foti C, Arsieni A. Is black henna responsible for asthma and cross reactivity with latex? J Eur Acad Dermatol Venereol 2007;21:714-5. Bolhaar ST, Mulder M, van Ginkel CJ. IgE-mediated allergy to henna. Allergy 2001;56:248. Khanna N. Hand dermatitis in beauticians in India. Indian J Dermatol Venereol Leprol 1997;63:157-61. Almeida PJ, Borrego L, Pulido-Melián E, González-Díaz O. Quantification of p-phenylenediamine and 2-hydroxy-1, 4-naphthoquinone in henna tattoos. Contact Dermatitis 2012;66:33-7. Sidwell RU, Francis ND, Basarab T, Morar N. Vesicular erythema multiforme-like reaction to para-phenylenediamine in a henna tattoo. Pediatr Dermatol 2008;25:201-4. Oztas MO, Onder M, Oztas P, Atahan C. Contact allergy to henna. J Eur Acad Dermatol Venereol 2001;15:91-2. Broides A, Sofer S, Lazar I. Contact dermatitis with severe scalp swelling and upper airway compromise due to black henna hair dye. Pediatr Emerg Care 2011;27:745-6. Jung P, Sesztak-Greinecker G, Wantke F, Götz M, Jarisch R, Hemmer W. A painful experience: Black henna tattoo causing severe, bullous contact dermatitis. Contact Dermatitis 2006;54:219-20. Jung P, Sesztak-Greinecker G, Wantke F, Götz M, Jarisch R, Hemmer W. The extent of black henna tattoo's complications are not restricted to PPD-sensitization. Contact Dermatitis 2006;55:57. Valsecchi R, Leghissa P, Di Landro A, Bartolozzi F, Riva M, Bancone C. Persistent leukoderma after henna tattoo. Contact Dermatitis 2007;56:108-9.
del Boz J, Martín T, Samaniego E, Vera A, Morón D, Crespo V. Temporary localized hypertrichosis after henna pseudotattoo. Pediatr Dermatol 2008;25:274-5. Rubegni P, Fimiani M, de Aloe G, Andreassi L. Lichenoid reaction to temporary tattoo. Contact Dermatitis 2000;42:117-8. Gunasti S, Aksungur VL. Severe inflammatory and keloidal, allergic reaction due to para-phenylenediamine in temporary tattoos. Indian J Dermatol Venereol Leprol 2010;76:165-7. Tan E, Garioch J. Black henna tattoos: Coexisting rubber and para-phenylenediamine allergy? Clin Exp Dermatol 2007;32:782-3. Raupp P, Hassan JA, Varughese M, Kristiansson B. Henna causes life threatening haemolysis in glucose-6-phosphate dehydrogenase deficiency. Arch Dis Child 2001;85:411-2. Nath AK, Thappa DM. 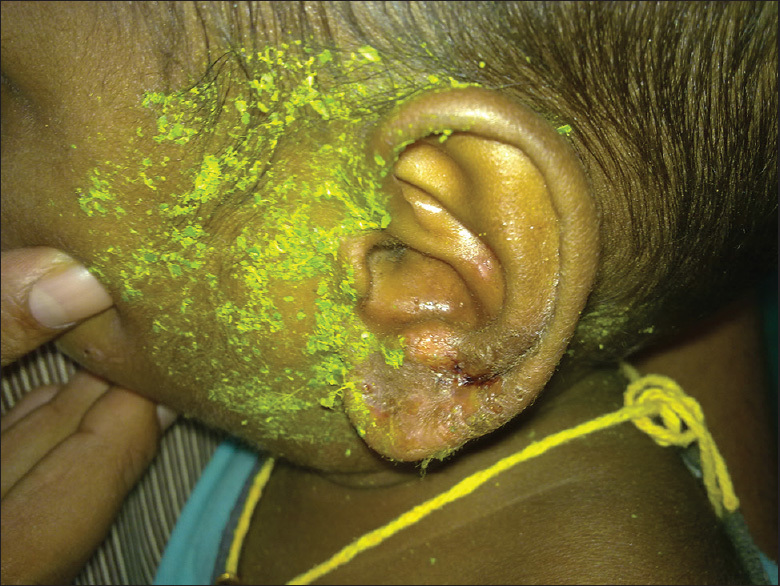 Kumkum-induced dermatitis: An analysis of 46 cases. Clin Exp Dermatol 2007;32:385-7. Tewary M, Ahmed I. Bindi dermatitis to 'chandan' bindi. Contact Dermatitis 2006;55:372-4. Kumar AS, Pandhi RK, Bhutani LK. Bindi dermatoses. Int J Dermatol 1986;25:434-5. Osmundsen PE. Pigmented contact dermatitis. Br J Dermatol 1970;83:296-301. 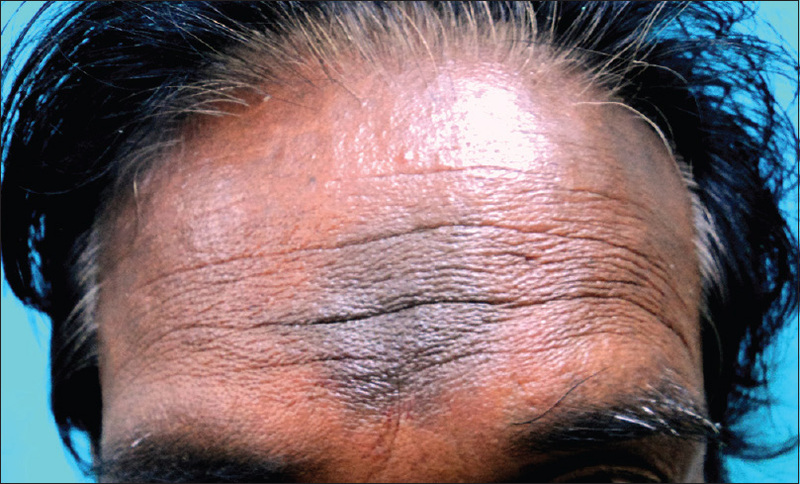 Goh CL, Kozuka T. Pigmented contact dermatitis from 'kumkum'. Clin Exp Dermatol 1986;11:603-6. Mehta SS, Reddy BS. Cosmetic dermatitis-current perspectives. Int J Dermatol 2003;42:533-42. Bajaj AK, Govil DC. Contact depigmentation. Indian J Dermatol Venereol Leprol 1982;48:112-5. Bajaj AK, Govil DC, Bajaj S. Bindi depigmentation. Arch Dermatol 1983;119:629. Mathur AK, Srivastava AK, Singh A, Gupta BN. Contact depigmentation by adhesive material of bindi. Contact Dermatitis 1991;24:310-1. Bose SK. 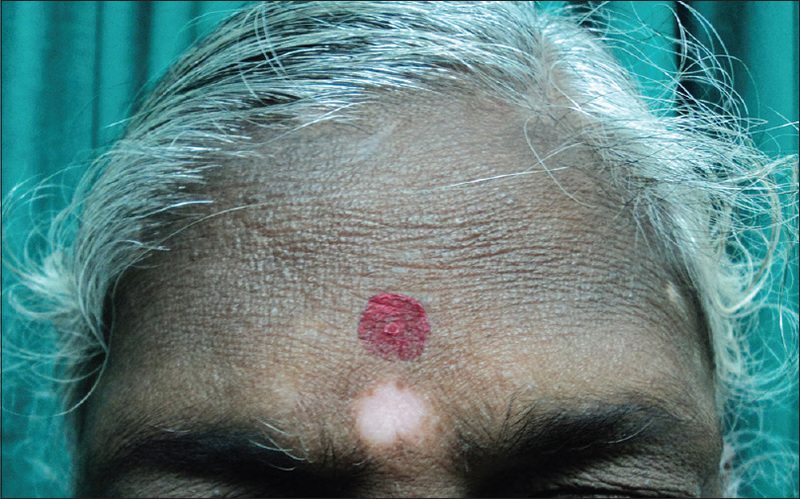 Is bindi-induced depigmentation common in patients predisposed to vitiligo? J Dermatol 1994;21:370-1. Baxter KF, Wilkinson SM. Contact dermatitis from a nickel-containing bindi. Contact Dermatitis 2002;47:55. 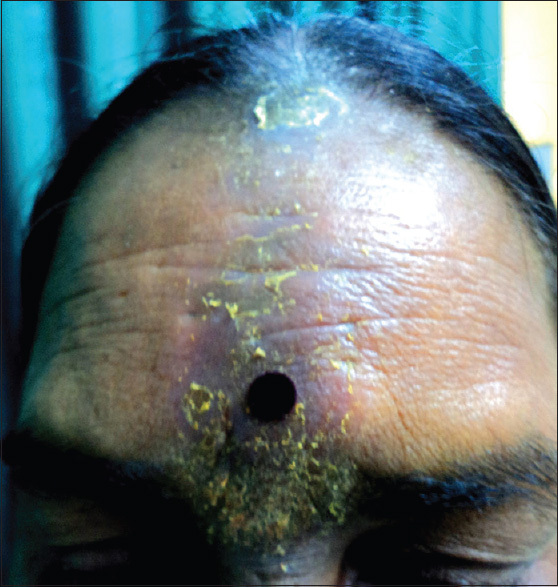 Ramesh V. Foreign-body granuloma on the forehead: Reaction to bindi. Arch Dermatol 1991;127:424. Bajaj AK, Gupta SC, Chatterjee AK. Contact depigmentation from free para-tertiary-butylphenol in bindi adhesive. Contact Dermatitis 1990;22:99-102. Calnan CD, Cooke MA. Leukoderma in industry. J Soc Occup Med 1974;24:59-61. Dwyer CM, Forsyth A. Allergic contact dermatitis from bindi. Contact Dermatitis 1994;30:174. Laxmisha C, Nath AK, Thappa DM. Bindi dermatitis due to thimerosal and gallate mix. J Eur Acad Dermatol Venereol 2006;20:1370-2. Bajaj AK, Saraswat A, Srivastav PK. Chemical leucoderma: Indian scenario, prognosis, and treatment. Indian J Dermatol 2010;55:250-4. Bajaj AK, Pandey RK, Misra K, Chatterji AK, Tiwari A, Basu S. Contact depigmentation caused by an azo dye in alta. Contact Dermatitis 1998;38:189-93. Bajaj AK, Misra A, Misra K, Rastogi S. The azo dye solvent yellow 3 produces depigmentation. Contact Dermatitis 2000;42:237-8. Ghosh SK, Bandyopadhyay D, Verma SB. Cultural practice and dermatology: The "Holi" dermatoses. Int J Dermatol 2012;51:1385-7. Society for the Confluence of Festivals in India (SCFI). Holi. Available from: http://www.holifestival.org/eco-friendly-holi.html. [Last accessed on 2013 Oct 16]. Ghosh SK, Bandyopadhyay D, Chatterjee G, Saha D. The 'holi' dermatoses: Annual spate of skin diseases following the spring festival in India. Indian J Dermatol 2009;54:240-2. 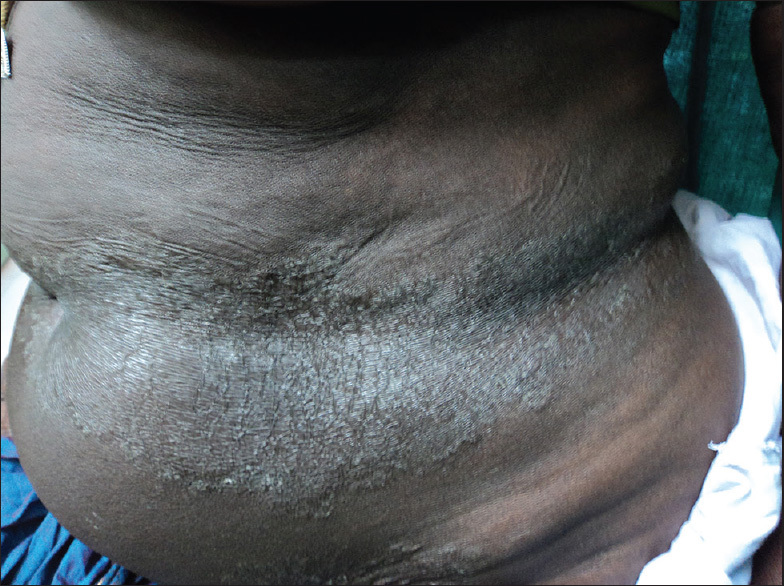 Gharpuray MB, Kulkarni V, Tolat S. Mudi-chood: An unusual tropical dermatosis. Int J Dermatol 1992;31:396-7. Sugathan P. Mudi-childhood on the pinnae. Br J Dermatol 1976;95:197-8. Sugathan P, Martin AM. Mudi-chood: On the forearm. Indian J Dermatol 2011;56:228-9. Sugathan P. Mudi-chood disease. Dermatol Online J 1999;5:5. Abdel-Gawad MM, Abdel-Hamid IA, Wagner RF Jr. Khite: A non-western technique for temporary hair removal. Int J Dermatol 1997;36:217. Verma SB. Vitiligo koebnerized by eyebrow plucking by threading. J Cosmet Dermatol 2002;1:214-5. Verma SB. Eyebrow threading: A popular hair-removal procedure and its seldom-discussed complications. Clin Exp Dermatol 2009;34:363-5. Bloom MW, Carter EL. Bullous impetigo of the face after epilation by threading. Arch Dermatol 2005;141:1174-5. Lilly E, Kundu RV. Dermatoses secondary to Asian cultural practices. Int J Dermatol 2012;51:372-82. Nicolaou N, Johnston GA. The use of complementary medicine by patients referred to a contact dermatitis clinic. Contact Dermatitis 2004;51:30-3. Kew J, Morris C, Aihie A, Fysh R, Jones S, Brooks D. Arsenic and mercury intoxication due to Indian ethnic remedies. BMJ 1993;306:506-7. Khandpur S, Malhotra AK, Bhatia V, Gupta S, Sharma VK, Mishra R, et al. Chronic arsenic toxicity from Ayurvedic medicines. Int J Dermatol 2008;47:618-21. 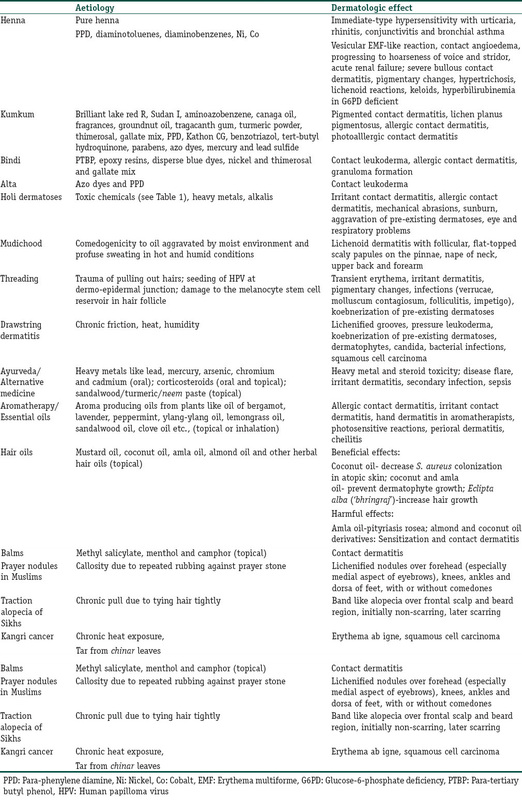 Ernst E. Adverse effects of herbal drugs in dermatology. Br J Dermatol 2000;143:923-9. Verma S. Effect of alternative medicinal systems and general practice. Int J Dermatol 2007;46 Suppl 2:46-50. Lakshmi C, Srinivas CR. Allergic contact dermatitis following aromatherapy with valiya narayana thailam--an ayurvedic oil presenting as exfoliative dermatitis. Contact Dermatitis 2009;61:297-8. Yang CC, Tu ME, Wu YH. Allergic contact dermatitis from incense. Contact Dermatitis 2009;61:185-6. Wu PA, James WD. Lavender. Dermatitis 2011;22:344-7. Herro E, Jacob SE. Mentha piperita (peppermint). Dermatitis 2010;21:327-9. Kaddu S, Kerl H, Wolf P. Accidental bullous phototoxic reactions to bergamot aromatherapy oil. J Am Acad Dermatol 2001;45:458-61. Boonchai W, Iamtharachai P, Sunthonpalin P. Occupational allergic contact dermatitis from essential oils in aromatherapists. Contact Dermatitis 2007;56:181-2. Crawford GH, Katz KA, Ellis E, James WD. Use of aromatherapy products and increased risk of hand dermatitis in massage therapists. Arch Dermatol 2004;140:991-6. Weiss RR, James WD. Allergic contact dermatitis from aromatherapy. Am J Contact Dermat 1997;8:250-1. Uter W, Schmidt E, Geier J, Lessmann H, Schnuch A, Frosch P. Contact allergy to essential oils: Current patch test results (2000-2008) from the Information Network of Departments of Dermatology (IVDK). Contact Dermatitis 2010;63:277-83. Williams JD, Tate BJ. Occupational allergic contact dermatitis from olive oil. Contact Dermatitis 2006;55:251-2. Steinmann A, Schätzle M, Agathos M, Breit R. Allergic contact dermatitis from black cumin (Nigella sativa) oil after topical use. Contact Dermatitis 1997;36:268-9. Hata M, Sasaki E, Ota M, Fujimoto K, Yajima J, Shichida T, et al. Allergic contact dermatitis from curcumin (turmeric). Contact Dermatitis 1997;36:107-8. Bilsland D, Strong A. Allergic contact dermatitis from the essential oil of French marigold (Tagetes patula) in an aromatherapist. Contact Dermatitis 1990;23:55-6. Schaller M, Korting HC. Allergic airborne contact dermatitis from essential oils used in aromatherapy. Clin Exp Dermatol 1995;20:143-5. Rubel DM, Freeman S, Southwell IA. Tea tree oil allergy: What is the offending agent? Report of three cases of tea tree oil allergy and review of the literature. Australas J Dermatol 1998;39:244-7. Dharmagunawardena B, Takwale A, Sanders KJ, Cannan S, Rodger A, Ilchyshyn A. Gas chromatography: An investigative tool in multiple allergies to essential oils. Contact Dermatitis 2002;47:288-92. Ayur Natural Beauty. Navratna Plus Herbal Cool Oil-Product Description. Available from: http://www.ayurnaturalbeauty.com/products/Navratna-Plus-Herbal-Cool-Oil.html. [Last accessed on 2013 Oct 16]. Garg AP, Müller J. Inhibition of growth of dermatophytes by Indian hair oils. Mycoses 1992;35:363-9. Roy RK, Thakur M, Dixit VK. Development and evaluation of polyherbal formulation for hair growth-promoting activity. J Cosmet Dermatol 2007;6:108-12. Zawar V. Pityriasis rosea-like eruptions due to mustard oil application. Indian J Dermatol Venereol Leprol 2005;71:282-4. Guillet G, Guillet MH. Percutaneous sensitization to almond oil in infancy and study of ointments in 27 children with food allergy. Allerg Immunol (Paris) 2000;32:309-11. Shaffer KK, Jaimes JP, Hordinsky MK, Zielke GR, Warshaw EM. Allergenicity and cross-reactivity of coconut oil derivatives: A double-blind randomized controlled pilot study. Dermatitis 2006;17:71-6. Suuronen K, Pesonen M, Aalto-Korte K. Occupational contact allergy to cocamidopropyl betaine and its impurities. Contact Dermatitis 2012;66:286-92. Pinola A, Estlander T, Jolanki R, Tarvainen K, Kanerva L. Occupational allergic contact dermatitis due to coconut diethanolamide (cocamide DEA). Contact Dermatitis 1993;29:262-5. Roberts H, Williams J, Tate B. Allergic contact dermatitis to panthenol and cocamidopropyl PG dimonium chloride phosphate in a facial hydrating lotion. Contact Dermatitis 2006;55:369-70. Lee TY, Lam TH. Patch testing of 11 common herbal topical medicaments in Hong Kong. Contact Dermatitis 1990;22:137-40. Rietschel RL, Fowler JF. Medications from plants. In: Rietschel RL, Fowler JF, editors. Fisher's Contact Dermatitis. 6 th ed. Hamilton: BC Decker Inc; 2008. p. 175-89. Verma SB. 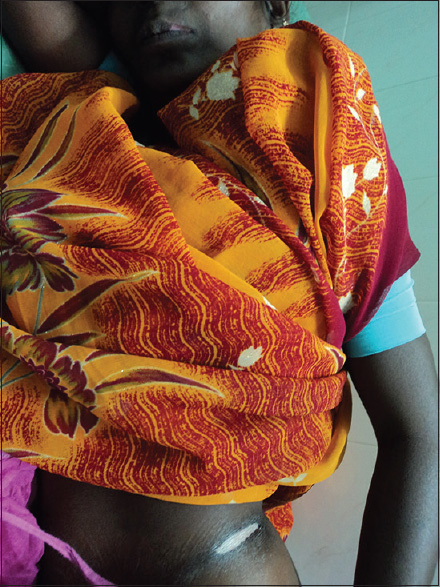 Dermatological signs in South Asian women induced by sari and petticoat drawstrings. Clin Exp Dermatol 2010;35:459-61. English JS, Fenton DA, Wilkinson JD. Prayer nodules. Clin Exp Dermatol 1984;9:97-8. Vollum DI, Azadeh B. Prayer nodules. Clin Exp Dermatol 1979;4:39-47. Abanmi AA, Al Zouman AY, Al Hussaini H, Al-Asmari A. Prayer marks. Int J Dermatol 2002;41:411-4. O'Goshi KI, Aoyama H, Tagami H. Mucin deposition in a prayer nodule on the forehead. Dermatology 1998;196:364. Karimian-Teherani D, El Shabrawi-Caelen L, Tanew A. Traction alopecia in two adolescent Sikh brothers-an underrecognized problem unmasked by migration. Pediatr Dermatol 2011;28:336-8. Kanwar AJ, Kaur S, Basak P, Sharma R. Traction alopecia in Sikh males. Arch Dermatol 1989;125:1587. Wani I. Kangri cancer. Surgery 2010;147:586-8. Suryanarayan CR. Kangri cancer in Kashmir valley: Preliminary study. J Surg Oncol 1973;5:327-33. Gothoskar SV, Ranadive KJ. Experimental studies on the aetiology of "Kangri cancer". Br J Cancer 1966;20:751-5. This is a comprehensive and an inclusive review for ready referral for physicians who are not aware of the various skin disorders that can result from Indian socio-religious and cultural habits.